It’s fun to decorate for Halloween but it is even more fun when you can craft your own decorations using materials that you have on hand. Using recycled material in a craft project is both green and money saving. This means you may have more of an opportunity to go all out with your holiday decorating. I found a nice variety of Halloween crafts that are decorative, affordable and easy to make. 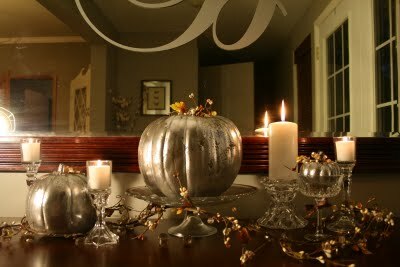 Can you believe that these faux mercury glass pumpkins were made by recycling some faux white pumpkins? This beautiful transformation was done by Roeschel at the DIY Show Off. You don’t need to settle for ordinary decor, you can create something extraordinary with a little paint and embellishment. These paint can Jack-O-Lanterns are absolutely adorable! I’m thinking I could empty the little bit of paint that I have in a couple of cans just to make these lanterns. This craft idea by Fun In The Making looks to be truly fun to make. Each lantern, lining a path, would be unique with it’s own face and style. I love bottle art and these recycled bottles in a plaster mummy style design are just perfect for your Halloween display. 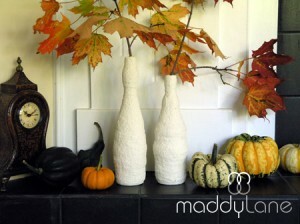 The mummy white vase makes a striking contrast to the Autumn leaves. This next craft comes from a material that you may not have readily available. 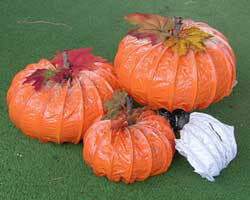 These pumpkins are made from recycled dryer vent hose. Who would have thought? If you happen to have some of this laying around, then these pumpkins would be adorable to make. This creative idea by Crafters Love Crafts is truly original and clever. This tin can luminary craft by Jane Lake is a perfect example of using a common recycled material in a project. 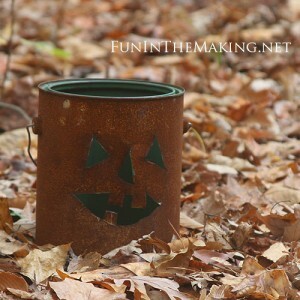 All you need to do is save your tin cans to create an illuminated path for your trick or treaters on Halloween night. The other materials required are minimal as outlined in the tutorial. 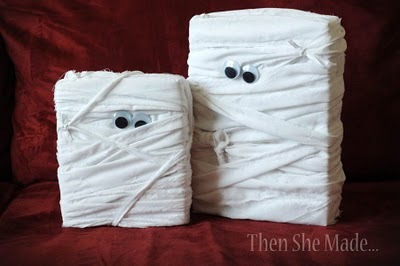 Even though these are mummies, they are way more cute then they are scary. This craft by, Then She Made, makes use of recycled food boxes as the base for the design. You could make fun groupings in many sizes depending on the boxes that you have.